I first heard the expression “from NIMBY (not in my back yard) to NOPE (not on planet earth)” from Ben Gotschall, a rancher and Energy Director with Bold Nebraska. Ben first entered the fight against TransCanada’s Keystone XL pipeline because it threatened the Ogallala aquifer, the water source his ranch depends on. The Council of Canadians brought him to Canada to speak with audiences along the Energy East pipeline path in New Brunswick, Manitoba and Saskatchewan. 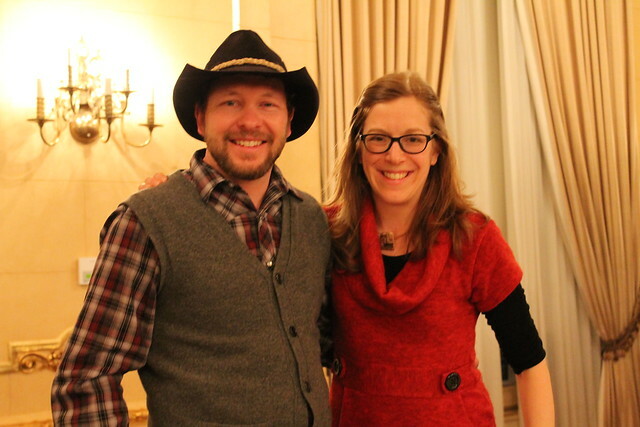 He shared insights about his journey, which started with his desire to protect his ranch and resulted in him joining a movement that rejects the expansion of the Alberta tar sands because of its impacts on Indigenous communities, our water and climate. Ben helped empower people by sharing his experiences working with landowners and Indigenous communities fighting Keystone XL in Nebraska. The four Energy East speaker tour events the Council organized – which included public forums, meetings and actions – included speakers with frontline experience fighting pipelines as well as people who have experienced major oil spills. These events helped establish relationships and communication amongst communities here in Canada that has since flourished into hubs of resistance to Energy East. I believe now is the time to ensure we are collectively moving past focusing on any one project. Indigenous rights need to be respected along all pipeline routes. We must protect drinking water everywhere at a time of increased water pollution and water scarcity. We shouldn’t have to choose between protecting orcas or right whales, or the health of people living near the port in Vancouver or the planned oil storage tanks in Red Head, Saint John. If we stand a chance at getting a 100% clean economy by 2050 – no tar sands pipeline project can proceed. The estimated upstream emissions of filling Kinder Morgan range between 14 and 17 megatonnes while Energy East would be 30 to 32 million tonnes – and this doesn’t include the downstream impacts of burning the oil. To help put this in perspective, Kinder Morgan’s upstream impact would be larger than the annual yearly emissions from New Brunswick and Energy East would be the equivalent of adding more than seven million cars on our roads. To have a chance of keeping warming below 2°C, scientists say we need to cut our emission by half within 20 years. Keeping to a 1.5°C target would require even steeper cuts. If Canada proceeds with tar sands and pipeline expansion plans, it could prevent the world from achieving these goals. I believe we need to cross pollinate our opposition to tar sands pipelines, lending strength and solidarity where it is needed. We are in a new reality for organizing. Strengthened climate policies are putting international pressure on the tar sands. Those policies, along with low oil prices, present distinct challenges to the Trudeau and Trump governments. And we shouldn’t stop at tar sands pipelines. We need to push for no new fossil fuel infrastructure given the timeline we face for responding to climate change. This means connecting with our friends fighting fracking and liquefied natural gas proposals and the new push for offshore drilling on Canada's Atlantic coast. The Council of Canadians will be focusing effort in these areas in the coming weeks. Our role is to help facilitate conversations and plan actions to help build solidarity in the fights against all of these projects. Here is an update on where the tar sands pipeline projects stand. While Alberta Premier Rachel Notley and New Brunswick Premier Brian Gallant quickly came to the project’s defence once again, there is a decent chance that the Energy East pipeline may indeed be coming to an end. The project is facing a tidal wave of challenges. Between climate policies, low oil prices and competing projects potentially moving ahead, the economic argument for this project – the largest tar sands pipeline project – is getting pretty weak. Energy East has also consistently faced a wall of opposition. The opposition has come from people protecting drinking water in Winnipeg, North Bay and Montreal, water and land defenders in the Indigenous communities the pipeline crosses, to the end of the line where people are fighting against massive oil storage units that put their health at risk and increased tankers in Bay of Fundy waters. 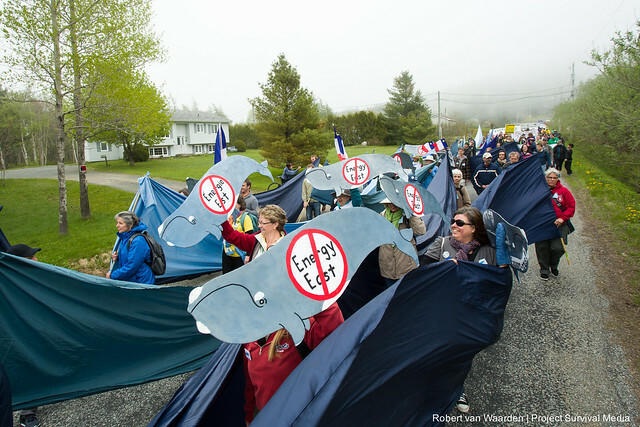 Seeing the NEB include upstream climate pollution impacts of filling the Energy East pipeline is a huge win – one that Council of Canadians supporters played a big part in. More than 100,000 people sent messages to the NEB demanding this. The Council of Canadians even tried to challenge the NEB legally over its original failure to include climate impacts. The Trudeau government officially approved the Kinder Morgan pipeline expansion, increasing its capacity to 830,000 barrels per day (bpd), last November. However, the project is far from a done deal and continues to face significant opposition. There is a new Tiny House Warriors movement where Indigenous and allied activists are building solar-powered tiny houses along the project's path to disrupt it. The Federal Court of Appeal will begin a judicial review of the federal government’s approval at hearings in Vancouver October 2-13. There are 9 legal challenges being heard – seven are from First Nations, others include the city of Burnaby, the Raincoast Conservation Foundation and Living Oceans Society. The new B.C. NDP government recently won approval to act as an intervenor. The government has also said that Kinder Morgan will not be allowed to begin construction on public lands. You can donate towards legal costs here. On September 9, hundreds of people flooded the streets of Vancouver yet again to say “no” to Kinder Morgan. There was also a push for the Port Authority of Vancouver to withhold the remaining permit Kinder Morgan needs to start construction, which could begin on these private lands as early as this month. Despite asking for public comments, the Port Authority approved the permit. The NEB is holding hearings through the fall and into early 2018 on the pipeline route. The Council of Canadians’ Chilliwack chapter is part of a group effort to get the pipeline moved away from Chilliwack's schools, wetlands, fault lines, homes, and drinking water. If construction does begin there will be people working on the ground to stop it. Even though U.S. President Barrack Obama rejected the Keystone XL project, President Trump brought the pipeline back to life by issuing an executive order to allow the 830,000 bpd pipeline – a move that was lauded by Prime Minister Justin Trudeau. Here again, the battle against this pipeline is not over. Nebraska, where Indigenous communities and landowners have fought vigorously to protect their land and water from a tar sands spill, has consistently presented a distinct challenge to this project. TransCanada is currently seeking route approval from the Nebraska Public Service Commission. The commission has until November 13 to make a decision. At recent hearings, more than 460,000 public comments calling for the rejection of the pipeline were submitted. Tribal attorneys established that TransCanada did not properly consult with Yankton Sioux or Ponca, or survey the historic Ponca Trail of Tears and other burial and sacred sites that KXL would cross. Regardless of its decision, opponents said they still expect the pipeline approval to wind up in court over efforts to build it on their land. Meanwhile, groups are mobilizing to build another two solar installations along the proposed pipeline path to power nearby homes and business and underscore the need to focus on climate change solutions and resist the expansion of the fossil fuel industry. There is also increasing evidence that the customer base for Keystone XL may no longer exist. Instead, the focus appears to be shifting to get oil to Asian markets, which are more easily reached from the B.C. coast than the U.S. Gulf. Enbridge’s Line 3, arguably the least known of these projects, would replace the existing 390,000 bpd pipeline built in 1968 with a new 760,000 bpd export pipeline that could carry tar sands crude for the next 50 to 60 years. Enbridge admits the pipeline would result in 19 to 26 megatonnes of upstream greenhouse gas emissions each year. Prime Minister Trudeau approved the construction of the new Line 3 pipeline in November 2016. Construction began this summer in Alberta, Saskatchewan and Wisconsin. The project was recently dealt a blow when the Minnesota Department of Commerce concluded "that Minnesota would be better off if Enbridge proposed to cease operations of the existing Line 3, without any new pipeline being built." The Minnesota Public Utilities Commission (PUC) will not make its final decision on the pipeline until April 30, 2018. In Canada, the Assembly of Manitoba Chiefs, along with the Ochapowace, Keeseekoose, George Gordon and Pasqua First Nations in Saskatchewan, have all expressed concerns about the pipeline. The Qu'Appelle Valley Environmental Association in Saskatchewan has stated, "[The Line 3 pipeline] will crisscross fourteen of our watercourses, including our major rivers – tunneling under the South Saskatchewan River, south of Outlook, and under the Qu’Appelle River, near Bethune."